1 Most of the earth's surface is covered with water. Water is a very powerful force of nature. Water must be contained in some way. The banks of rivers and lakes and beaches stop the water from spreading all over the land. Sometimes there is too much water. 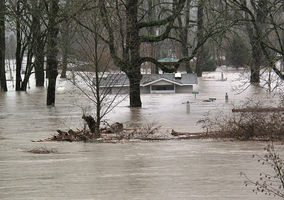 The banks may not be high enough to keep the water where it belongs. When water overflows its banks and flows over dry land it is called a flood. 2 A sudden thunderstorm or heavy rainfall can cause a flood. Sometimes the cause of flooding is a long way away. When water is needed for irrigation, a concrete wall called a dam is built across a river. The dam stops the water in the river from flowing. Water is collected and stored in reservoirs for later use. Sometimes the stored water is used for making electricity. Dams are a way of controlling rivers and preventing floods. However, a dam can burst and cause flooding without warning. When this happens people are surprised by the raging water that destroys everything in its path. 3 Most flooding is caused by nature. Floods happen when there is too much water in one place. When it cannot escape, it spreads out and flows downhill. There are many different kinds of floods. There are slow kinds that are often caused by long periods of rain. In some places these long periods of rain are called monsoons. A flood that happens very quickly is called a flash flood. It can happen as a result of too much rainfall or warm temperatures melting snow in the mountains too quickly.